The Green Party says Government should tread cautiously and avoid criminality on Eurobond refinancing. Responding to a question on President Edgar Lungu’s request for a Turkey business entity to refinance the Zambia Eurobonds, Green Party leader Peter Sinkamba said there is nothing sinister for a private business entity to refinance the Eurobond provided such an arrangement is done within the prescribed laws. Mr. Sinkamba explained that the largest portion of our foreign debt is owed to commercial creditors and accounts for nearly half of the total external debt stock of US$3.0 billion Eurobond debt. “This money in question is not money lent by bilateral or multilateral to Government. Rather it is private money lent by commercial creditors to Government. There are agreements and rules that govern bilateral and multilateral transactions. And there are laws and regulations that govern commercial transactions between Government and private entities. So logically, there is nothing sinister for Government to enter into a lending transaction with bilateral and multilateral partners. And equally, there is nothing sinister for Governmet and a private entity to enter into any transaction including the propsoed bailout by way of refinancing the Eurobonds. The only catch is that either way, any such transaction should be executed within the framework of agreements and the prescribed law,” Mr. Sinkamba said. “So, the starting point is for Government to tread cautiously on the proposed Eurobond refinancing strategy. Since the proposed arrangement is not a bilateral or multilateral financing arrangement but private business entity, this triggers into effect the Zambia Public Procurement Act on award contracts especially as regard to single-sourcing. It also triggers in the Anti-Corruption Act, Public Procurement Act, Public Finance Management Act, Minister of Finance (Incorporation) Act, Citizens Economic Empowerment Act, Zambia Competition and Consumer Protection Act, and other laws and regulations,” he said. He said that since commercial debts, and particularly Eurobonds, carry significantly higher borrowing costs than concessional debt, and considering the amounts involved in the prposed Eurobond bailout, there is no doubt in his mind that legally, any private refinancing arrangements such as the proposed arrangement would require public tendering for competitiveness’s sake as required by law. “The amounts involved are colossal. If it is a mere grant without any additional costs to the already agreed upon costs at vesting, there would have no problem at all. We would not have needed any bidding process if there is no additional costs. But where any arrangement entails additional costs, then the bid process and other requirements are triggered in,” Mr. Sinkamba explained. He however indicated that the laws provide for limits for single-sourcing depending on the amount involved and added that any disregard of such thresholds is criminal. “So, Government leaders should be cautious so as to avoid any elements of criminality in the proposed transaction by following requirements of the prescribed law,” he added. Asked what he would have done differently if his party was in government, Mr. Sinkamba explained that refinancing of the Eurobond debt would not have been an option. He said his government would have opted for dismantling of the debt by liquidating it through extra revenue from marijuana industrialization. “You see, we have been vindicated on our marijuana industrialization agenda. The whole world has come to agree with us that marijuana is big business and they have since provided frameworks for implementation of our agnda. Our programme is targetted to generate in excess of US$36 billion per annum from the marijuana industrialization. With this sort of extra money in our hands, we could have simply paid off the entire domestic and external debt currently estimated at US$13.5 Billion. We could have been a debt-free nation by the end of 2019,” Mr. Sinkamba said. Sinkamba is now compromising on quality and focusing on quantity with his statements. What can Sinkamba write about PF mob of drunk guys. PF is like they are in a bar, just so chaotic, and no one remember what they did yesterday. Today is another drinking day, forget about Turkey, whatever Turkey wrote down PF won’t remember. Jay Jay: Dont be subjective. Be objective. Sinkamba has expressed his opinion. When he is asked by the media to make a comment on a matter of public interest, he is duty bound to respond based on his understanding of the issue on the table. He has responded on the topical issue of Eurobond visaviz Turkey involvement. Your role is either agree with him on his sentiments or fault his arguments. I am at pains to identify anything that this government has done that is completely legal. Zambia is being run by crooked deceitful cow boys with no pride. We have a drunkard as leader, that is asleep at the wheel. Ze Biggy – What Peter is stating is just “standard procedure”…now we all know that these words are not synonymous with our friends in the PF..remember they have been lieing their way from Fossil Chikwanda’s era to date about Sink fund account, subsidy removal funds etc…the time for soothing objective statements is long gone as the cancer is now irreversible. Jay Jay: I advise you to think before you act. Sometimes you make very objective statements which many a time i applaud. But to turn around and state that “time for objective statements is gone” implying that what I should expect from you from this point is crap, and nothing else but crap, is to say the least appalling and nauseating. LT is a credible and respected platform. It has very good global readership. It is unthinkable and irresponsible for LT bloggers to share crap, and nothing else but crap. That is not only offensive to LT but totally nonsensical to genuine bloggers who expect intelligent reactions and commentaries on various stories posted by LT. I beg you to revert to your origional objective self, not the crap tag you want posit going forward. Ze Biggy – if you want objectivity regarding this topic you go to Maggie at Finance Ministry and get it…Lazy and PF have telling lies for the past 12 months that debts is sustainable …they were pressed and pressed still refused to be accountable and transparent.. its no surprise IMF refused to give Zambian relief funding because the numbers have not been adding up for the last 5 years only God knows the true figure of the debt. Today they are looking for refinancing arrangements from a private Turkish firm because of lack of fiscal discipline …it seem you have a short memory and are not aware of Donegal vulture fund which was a small figure now add three zeros to figures we are talking about today. future grand children to be objective when they are paying 60% of their tax to the Turks and Chinese. ..tell us how you get on with that. What are you trying to say ? Please feel free to use even any local lunguage, if the English lunguage is a challenge. Ze Biggy – It seems you are not new to LT but this is the first time am seeing this name “Ze Biggy”….please use the blogging name you usually use on LT. In response to your post 1.12 – in a layman’s term; it means “get stuffed” you want the meaning for that as well. 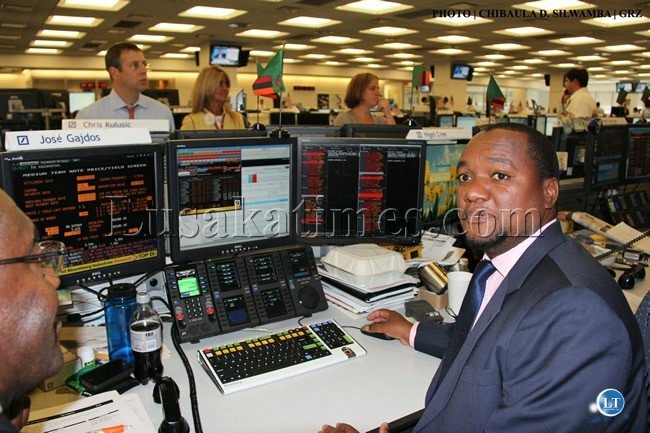 There is one Miles Sampa in the photo celebrating EUROBOND subscription…today he is Mayor of Lusaka only in Zambia can this happen with docile ill-informed voters. It’s complicated to deal with the PF, all their mind set are those of witches, indoshi. You never know if they are doing to clean up evil or just doing evil. You don’t even know what I mean, yes it’s because am referring to PF, just a bunch of dirty minded felas. Thanks Sinkamba for this insight!! Let us hope other opposition parties especially those represented in Parliament and other well meaning PF MPs and civic organizations will dissect this whole Eurobond refinancing idea and give Zambians what should be a fair deal!! Whatever you smoke must be really strong for you to think anything good can come of mother fckg PF MPs who are there to serve their smelly stomachs! Most PF MPs are not educated anyway and can’t even what refinancing is about. You think Bowman Lusambo, Steven Kampyongo, Inonge Wina and even Edgar Lungu would understand intricacies of Eurobonds? Impossible! @4.1 Chilyata, I DON’T smoke but I believe politics are dynamic!DON’T think everything is static. As far as I know even the corrupt may think with the majority at times especially once they see that greed has gone over top!! Don’t forget that some PF MPs don’t agree with the “MMD way of managing national affairs” so the issues may not be as you always think they are!! WHY DO YOU THINK THEY FOUGHT THE IMPEACHMENT BEFORE IT EVEN REACHED PARLIAMENT? WEREN’T THEY AFRAID OF THEIR OWN PF MPs? This uproar against Lunguand PF is misplaced. It is totally clueless. The greatest blame lies with, We the People–We the thinking people concerned about our grandchildren and great-grandchildren. The people can correct this folly, incompetence and reckless criminality if they chose to. Even now. Even today, through removing the shameful incompetence of Lungu and PF. PF and Lungu. Our grandchildren and great-grandchildren will judge us harshly.